LOCATION: Athi River, situated about 30 kilometers southeast of Nairobi. 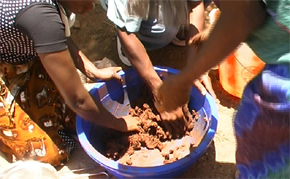 The whole group of 19 people convened at the Western Women's Network compound in the afternoon to make the clayballs. 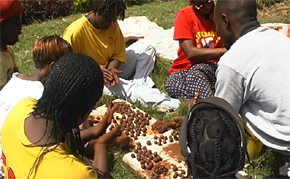 After viewing a short clip demonstrating how the clayballs are made, the group proceeded on with the task. The clay was sieved using 2 big metal and mesh sieves to produce very fine clay. This is best for the exercise. Water and the different types of seeds were added into the clay and kneaded to form a clay dough. The dough had to be beaten several times on a cement floor to remove air from within it. The clayballs were then made from the dough. The whole exercise lasted about 3 hours. The balls were put to dry outside in the afternoon sun. It was then agreed that broadcasting the balls would be carried out on the 27th(Saturday) of March by which time the would have properly dried. The group this time consisted of only part of the previous one. 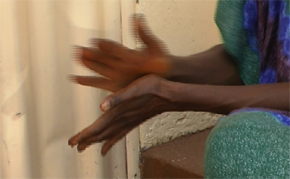 The meeting point was the Western Women's Network office at about 12.30pm. Participating were 2 women from the WWN, 2 people from Rigaudis416prod and 3 volunteers. The clayballs were dry and ready. They were collected and put in bags. 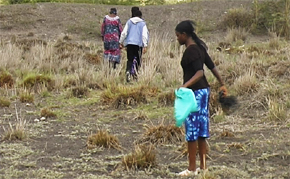 The group set off at 1pm and drove to Athi River. Due to poor road conditions in some parts the drive took longer than it should - about 50 minutes. On arrival, broadcasting swiftly commenced over a portion of land measuring about 100 square meters. The exercise lasted for about 20-30 minutes. Some of the clayballs had cracked. This was probably due to some air still being in parts of the dough mixture or because of the intense direct sunlight the balls were exposed to. Some of the members initially involved in the making of the clayballs were unable to join the team for broadcasting. This was due to transport constraints. The land used for the casting was/is not fenced and this could jeopardize the whole exercise. As soon as sprouting begins, the seedlings could be eaten by grazing animals. Fencing could not be done due to financial constraints. The whole exercise was satisfactorily carried out and another test will soon follow in a different area. The timing was perfect due to the expected rains which have started falling at the time of writing this report. The area broadcasted should be fenced very soon if possible to ensure good results.